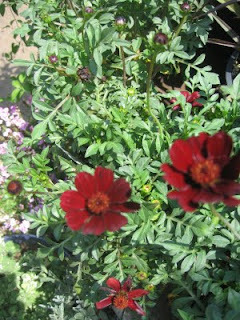 Chocolate cosmos - always a favorite, great color, a fun, low growing perennial. Lots of blooms! Hollyhocks are always a favorite! We have them in color packs right now: pink, yellow, and the awesome black! 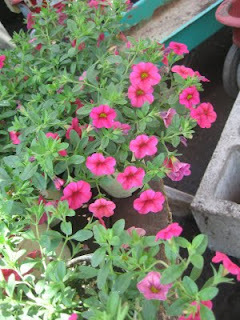 Million Bells provide great perennial color to pots, borders and hanging baskets. These things are almost always blooming! These nasturtiums are very cool - a red flower, and darker colored leaf than you normally see. They are displayed here next to some very cool new echeveria we got in that are just about to bloom! Duranta Geisha Girl is another favorite - we are big fans of Duranta in general, and this particular variety has a stunning bloom to it! Cordyline Ruby - SUCH cool red/pink color! This is a must have! We are down to our last few Brugsmania - don't worry, we will get more soon! 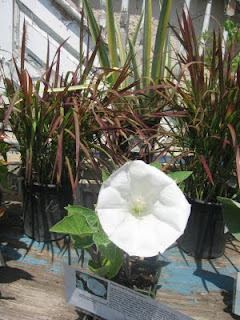 - but the white bloom on this is truly stunning! Pictured in the background is Imperata Red Baron, one of our all time favorite ornamental grasses! Come in and see us soon! We have all sorts of fun stuff available to make your summer gardening fun, and we'll be gearing up on our fall inventory real soon as well!